The nature of the Solid Oak Ledged Cottage door allows the Cottage door to be adapted to any style of home, be it a rural cottage, or a London Town house. Beaded both sides with three ledges. Flexible delivery options to suite. Delivery charge quoted on postcode. Our traditional Bespoke Solid Oak Ledge Barn Doors are manufactured in our own workshop in the heart of the Midlands from natural PEFC Certified European kiln dried solid oak of a character grade, knots are filled in the construction process. All doors are examined in detail on completion and before dispatch. Available in V groove or beaded. Ledged and Ledged and Brace doors are supplied sanded but unfinished for you to apply the finish of your choice. For advise on finish please call. Enhance the look of your door with ironmongery, solid oak latch blocks, architrave, skirting, Door linings. Get in touch with us for our monthly special offers on doors ironmongery and new additions to our ranges. We offer the full range of moldings - architrave, skirting, door casings along with latch blocks and a full range of modern and traditional ironmongery to complete the look of your project. Please call for any advice or general inquiries on 0800 0842711 / 01455 632481 or e-mail us on sales@oakdoors-gfm.co.uk were our team will be more than happy to help. 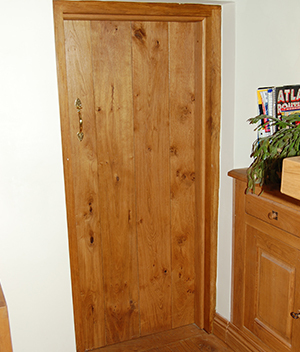 STANDARD SIZE SOLID OAK LEDGED DOORS FROM ONLY £132.00 INCLUSIVE OF VAT BUT NOT DELIVERY. PLEASE CALL FOR SPECIAL RATES ON DELIVERY. Sets of Door furniture - comprising of 1 x pair of 18" T hinges + thumblatch penny design. (15" T hinges also available.) hand finished beeswax. for only £36.00 inclusive of VAT but not postage & packing. For more information please contact us on 0800 0842711. Copyright © 2013 DOVETAIL JOINERY. All Rights Reserved.